Ann has illustrated seven popular children's books. She has collaborated with well known authors, such as Amy Welborn, Donna-Marie Cooper O'Boyle, Nancy Carpentier Brown, Regina Doman and Linda Krisch. Her book illustrations feature charming scenes with children and animals, richly detailed historical architecture and gorgeous scenery. Her compositions are painstakingly researched to create authentic settings for the stories. She has presented her books at schools, libraries and through numerous television and radio interviews. Ann personally presented her book "Friendship With Jesus" to Pope Benedict XVI at the Vatican. Contact Ann to purchase autographed books or to plan a school visit and book signing. Each year on the Third Sunday of Advent, children gather with their families in St. Peter’s Square for “Bambinelli Sunday.” The children bring with them figures of the Christ Child ~ the “Bambinelli”~ from their family’s Nativity scene, or presepe. Two cousins, Gianna and Lorenzo, are left for a day in the care of their great uncle, a Franciscan friar living in Assisi. Neither cousin wants to be with the other, and the day threatens to turn into a fiasco until Brother Antonio comes up with a game for them to play: They will discover the places where St. Francis lived and worked. As they lose themselves in the game, they come to better understand the qualities that marked St. Francis: humility, gentleness, kindness, simplicity and love. 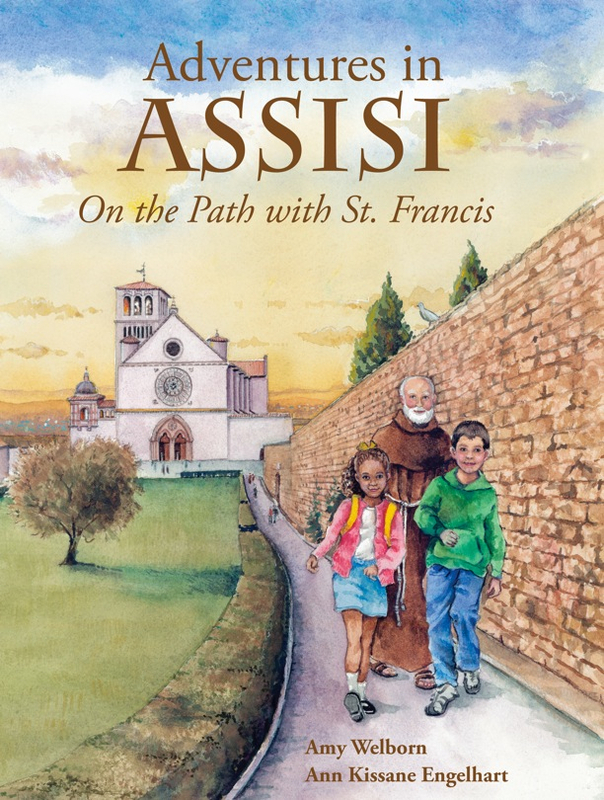 Children will learn about both St. Francis and Assisi in Amy Welborn's lovely tale, a picture book for children ages 5 and up. To receive Jesus in Holy Communion is to enter into a lifelong friendship with him. In this beautifully illustrated picture book, Amy Welborn, well-known author and blogger, introduces Pope Benedict's profound yet simple answers to various questions put to him by children in Rome who had recently made their First Holy Communion. Pope Benedict's answers, and the children's wonderful questions concerning this very important spiritual occasion in their young lives, provide inspiring text for this beautiful gift book for First Communion, as well as an invaluable resource for catechesis. How can we find happiness? 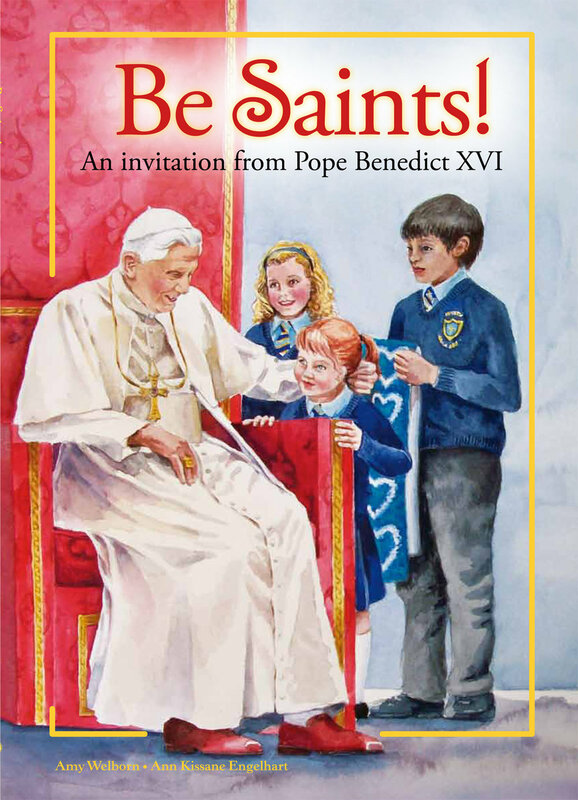 This richly illustrated picture book by Amy Welborn offers the answer to that question through the words of pope Benedict XVI as he spoke to children during his visit to England in 2010. The Pope Emeritus’ words are interspersed with the wisdom of the saints, including St. Francis, Mother Teresa, Poe St. John Paul II and Blessed John Henry Newman. The watercolor illustrations present scenes of children at play, in prayer, in their schools and with their families. In “Be Saints”, the pope’s words come to life for children ages 6-10, showing them how only God can satisfy the deepest needs of our hearts, and in knowing Him, we too are called to be saints. Introduce children to one of the most admired writers of the 20th Century, G.K. Chesterton, in this delightful fictional mystery based on real-life characters. Summer vacation turns into an adventure for the three Nicholl sisters when Mr. Gilbert Chesterton and his wife come to town. Eleven-year-old Clare hopes to write a detective story. Eight-year-old Cece wants to be a champion roller-skater. And ten-year-old Joan just wants to learn how to play the locked piano in the family living room. But as they befriend the Chestertons, skating accidents, surprising friendships, puppet shows, and mystery solving ensue! This illustrated chapter book is perfect for ages 8-10 and highly recommended for both young readers and grown ups alike. In this warm retelling of the true story of Our Lay of Fatima, children will discover the mysterious radiant holy Lady who suddenly appeared to three peasant farm children in Portugal. In this 100th Anniversary year of the event, this beautifully-illustrated chapter book by Donna-Marie Cooper O'Boyle, will encourage children to walk in the footsteps of Lucia, Francisco, and Jacinta and they will be led to ponder Our Lady’s message and how it should be applied to their own prayer lives. This authentic chapter book reads like a page-turning novel for children ages seven to one hundred and seven. In The Dirt Maker, by Linda Krisch, Luke learns how to "make dirt" with the help of his big brothers and some fat worms! This beautiful picture book about composting, shows how children can have fun in the garden, while being good stewards of the earth. This educational book can be used for lessons in the classroom, and for scouting and nature activities.